FeelReal? More like FeelRealUncomfortable. FeelReal is the 3DHead of VR Accessories. The 3DHead was the previous reigning champ of hilariously bad VR products. I typically like to stay away from scathing reviews, they just simply aren’t my style, but at GDC this year I was subjected to something that was so bad that it reminded me of my only other truly, hilariously awful VR experience 3DHead (there’s bad VR, and then there’s Sam Rami-esque bad VR). I tried to remain objectively optimistic before with 3DHead, but then again 3DHead didn’t aggressively violate a number of my senses, it just hurt my neck to wear. FeelReal took it a step further subjecting me to a number of thoroughly unpleasant sensory experiences… all while maintaining that wonderful form factor that puts your neck to the test. I had the FeelReal on for a maximum of three minutes, and within the first seconds I had stopped laughing and simply wanted to take this face-hugger off my head. Perhaps it was a case of uncanny valley syndrome, but it certainly didn’t FeelReal enough to get to that point. Lets break down why the FeelReal is just so bad, by highlighting it through what it purports to do well. Perhaps the biggest “selling point” is the FeelReal’s ability to add smells to a VR experience. Smell is one of the most powerful senses of them all. In fact smell is the sense that is most strongly tied to memories, and therefore makes for a compelling sense to bring into VR. This is not the first time someone has tried to bring smell to the entertainment experience. In 1962 Morton Heilig patented a system called the Sensorama, which may well have been the first ‘virtual reality’ machine (depending on who you ask). The system combined sight, sound, smell and touch to create an immersive cinema experience (albeit in a bucket seat without head tracking). In a lot of ways the FeelReal is like a miniaturized version of the Sensorama, and by miniaturized I mean it still feels like it weighs about 6 pounds (it actually weighs closer to one). So how does the smell work? There are scent cartridges that you insert into the device, which are filled with oils. Those oils are heated up and the vapor is released through a vent, like smoke out of the stacks at a plastic smelting factory. Seriously, these smells were akin to a cheap air filter mixed with burning plastic, and that was the “good” ones. You know the the ones where they showed me some pretty flowers and I was supposed to let my brain connect the dots? Yeah didn’t happen, my brain has a hard time reading flowers through the mix of the aforementioned burning plastic and residual smells. I found myself wondering if it was even healthy to be breathing in all this oil, I mean I don’t plug in my Air Wick and camp out next to it. Speaking of burning plastic, its as if they didn’t think that smell came through strongly enough. You know that smell that comes off a cheap space heater? The one that makes you wonder if it is worth keeping it by your bed to keep you warm? Yeah, imagine that close to your face while you are trying to scale Mordor. Not. Pleasant. The FeelReal tries to bring heat to your game, and does, but at the expense of comfort within the experience. Another thing that FeelReal tries to bring to the table is air, so that you can feel that cool breeze on top of the virtual mountain. Two problems, first of all the fan positions obviously can’t fit everyone’s face. The whole device is so massive that while it looks from the outside like it might be form fitting (I mean it has lips!) it really isn’t. It’s kinda like when you were a little kid and wanted the Superman mask and they were all out of the kid-sized ones so you had to get one that made you look like a giant bobblehead (oh wait, was that just me?). Anyway, I digress. The air thing actually could be a nice addition to VR, I’ve seen it work well before, Birdly is a good example. Thing is, those experiences didn’t try and dangle a fan in front of your face to get that effect. Doing so was not only unnecessary it was heavy, loud and distracting. It certainly isn’t worth what little benefit it adds. Really? Is splashing water in someone’s face really so important that they needed to jam it in here too? Honestly, I don’t see how they thought this ‘feature’ would be anything other than majorly obnoxious. I’m already going to be sweating thanks to that furnace they put next to my cheeks, why add to the watery mess? Seriously, this feature is utterly bizzare. Evoking memories of 4D theme park rides, which I always left wondering “why the heck did they need to splash me in the face with water?” I can’t really think of a single occasion where this feature would be a welcomed addition. Even if it was used exteremely sparingly it would be kind of annoying. A soft mist to the face does not replicate the feeling of splashing through white water rapids, and is actually so far from it that it is more distracting than anything (again, the uncanny valley comes to mind). The FeelReal also offers a facial vibration feature which wasn’t the worst thing ever. While it wasn’t an accessory feature I would really want, it was interesting having that kind of haptic feedback on my face, somewhere that typically has been ignored in the haptic device world. That being said, the size of this thing, combined with the intensity of the rumble caused me to feel the need to hold the device the entire time I was in it; lest it rumble off and painfully fall into my lap. Lets talk about this bluetooth microphone. So when I have a bounty hunter mask on, I obviously am going to need some way to communicate out, especially if I am slowly passing out due to being poisoned breathing in too much of that smell oil. But did they have to make it so creepy? I mean I’ve played Alien Makeout Simulator, and that was silly fun, but I don’t want creepy robot lips near mine the entire time I am in VR. FeelReal is going to be launching a Kickstarter last week, and if you still want to, by all means go ahead and drop the $250 they are asking on one. Their CEO, Gary Mostovoy, tells me the final version will be “three times smaller and three times lighter,” but says nothing to whether it will smell three times less like accident day at the toy factory. So if you want one, do you. 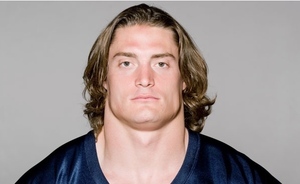 Who knows with enough use, maybe you too could have a neck like Paul Posluszny.